Dalsnibba is a mountain at an elevation of 1.476 m (4,843 ft) above the sea level, located in Stranda Municipality in Møre og Romsdal county in the western part of Norway. The drive offers the Europe’s highest fjord view by road. The road to the summit is very steep, with sections up to 12,3%. 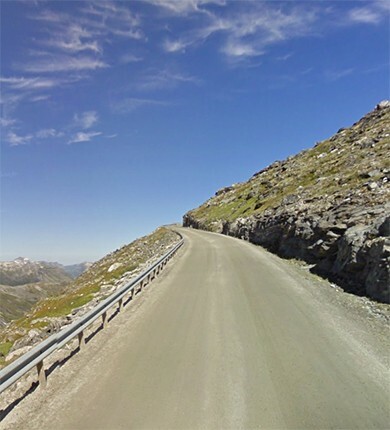 The road to the summit was tarmacked in 2013. It’s called Nibbevegen and has 11 hairpin bends. A quick glance at the map at its sheer drops and serpentine twists and turns, confirms that this is no hype. The road winds through a vertiginous valley affording impressive views. Don’t stuff your belly too much. Eventually, you might feel vomiting temptations while climbing circuitous roads at higher altitudes. There are sheer drops virtually along the entire route and enough hairpins to make a whirling dervish dizzy. This toll road was built in 1939 but due to the Second World War its official opening where delayed until 1948.The road up to Dalsnibba is one of the most ambitious road-building projects ever seen in Norway. Along the way, you’ll find info boards telling the unique history of the road, which is a sequence of hairpin bends and an experience in itself. It also gives a foretaste of the spectacular views awaiting you at the top to whet your appetite!